WHAT IS THIS? Advancing Leadership Youth brings together teens from all over the city for a comprehensive leadership development experience. Participants identify and build personal strengths, work with leaders from business, government, nonprofits and grass roots organizations and learn how to be an effective leader in any situation. ALY graduates are fully prepared to take their places within a new generation of leaders. WHY DID IT START? To nurture and develop positive leadership attributes in Federal Way area high school students, to drive change in their communities. 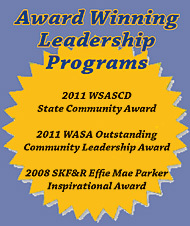 This student version of the original Advancing Leadership program began in 2005.
WHO IS IT FOR? The program is comprised of high school sophomores and juniors of diverse cultures and economic backgrounds. Participants are selected from applications submitted by high school students throughout Federal Way, including public, private and homeschooled students. WHEN DOES IT START, AND WHAT’S THE TIME COMMITMENT? Each spring applications are made available to high school youth in and around the City of Federal Way. Once participants are chosen, they are presented at the graduation of the existing class, then begin their own ALY class with a two-day retreat in August.